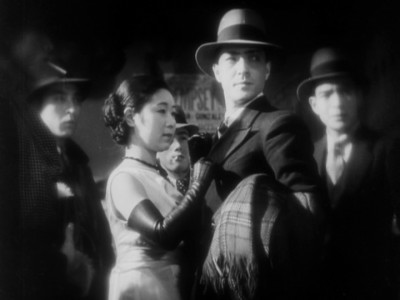 Ozu's first crime drama, Walk Cheerfully, reveals a lot of sympathy for the criminal class, which is carried through to the other films in this set. The story follows a lithe criminal kingpin by the name of Kenji, a.k.a. Ken the Knife (nicely portrayed by Minoru Takata). He is a pickpocket and gang leader who undergoes a severe re-evaluation of his priorities when he falls for a docile young office worker. 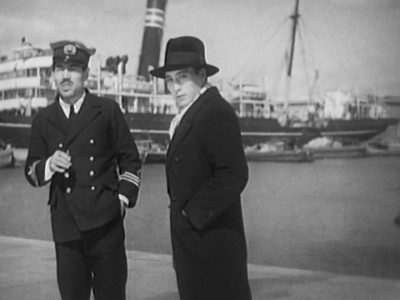 Ozu opens this film with a visually dazzling segment of an anonymous horde running towards something on a seaside dock - the object of their pursuit is a diminutive petty criminal, Senko (Hisao Yoshitani), revealed as Kenji's accomplice in a thieving scheme. Kenji has it pretty good with Senko and his fellow gangsters in their boxing club headquarters, but his complacency gets overturned by a chance encounter with a woman buying jewelry at a local merchant. Although Kenji at first believes that Yasue (Hiroko Kawasaki) is wealthy enough to buy a diamond ring for herself, she's really a secretary of humble means buying the bauble as a favor for her boss, who wants her as his mistress. After getting to know Yasue better, Kenji decides to forgo the crime syndicate for eternal wedded bliss. 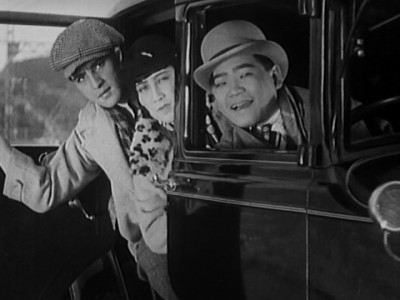 Kenji's spurned modern girlfriend in a Louise Brooks haircut, Chieko (Sakoto Date), has other plans for the two which includes arranging for the innocent Yasue to be alone in a hotel room with her lecherous boss. The somewhat typical storyline in Walk Cheerfully is bolstered by some fine, subtle performances and Ozu's still-impressive command of the silent film medium. It's a sweet, understated drama with some enjoyable comedy bits, such as the gangsters' elaborately choreographed greetings to each other. 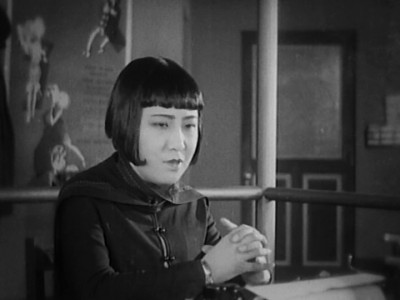 Yasue's office is decorated with a poster for Joan Crawford's silent Our Dancing Daughters, while the gangsters' hangout includes an image of Clara Bow in boxing gear - almost appearing as if Ozu is making a comment on Western culture's corrupting influence (unlike the flapper-esque Chieko, Yasue is depicted as a virginal ideal clad in traditional Japanese kimonos). In a change from the wide open spaces in Walk Cheerfully, Ozu turned to a more claustrophobic milieu with the same year's That Night's Wife. With a plot that shares more in common with the intimate family dramas he'd later be renowned for, the movie uses the crime genre as a framework for what otherwise would be a fairly standard-issue melodrama (and one that's padded-out to 65 minutes, at that). 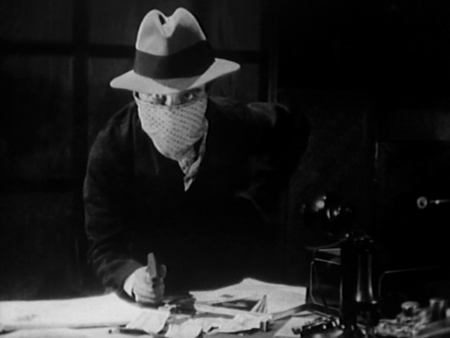 The story concerns a mysterious criminal who commits a nocturnal bank robbery in a town's urban center - a crime that leaves the police confounded. Eventually, it's revealed that the robber is no career criminal but an otherwise ordinary husband and father named Shuji (Tokihiko Okada). Shuji's crime was an act of desperation, it turns out, intended to pay off doctor's bills for treating his young, gravely ill daughter. Shuji's crime is pulled off flawlessly, yet the man has a deep sense of shame for what he did. 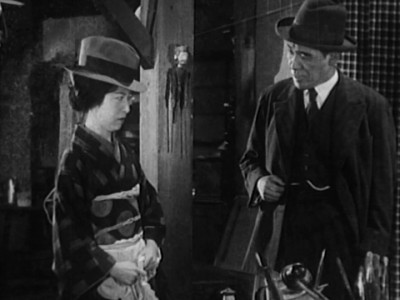 Ozu's conveyance of slow-building tension is further heightened when Shuji and his wife, Mayumi (Emiko Yagumo), are visited by Kagawa (Togo Yamamoto), a police detective. In a tense, all-night standoff that unravels with some surprising twists, Kagawa begins to have some sympathy for Shuji and Mayumi's plight. Despite Ozu's skill behind the camera, That Night's Wife seems like the most inconsequential effort of this trio, although there are some excellent, moody, proto-noir passages set up in the first twenty minutes when the criminal's identity has yet to be uncovered. The deliberately paced standoff tends to wear itself out pretty quickly, although Ozu accomplishes some elegant staging and camerawork in this constricted setting (the camera never leaves the couple's tiny apartment). The film is also bolstered by nice performances and a tender, intimate feel which avoids getting too manipulative. Somewhat incongruously, the apartment's decor includes posters for a Walter Huston film and an early talkie musical, Broadway Scandals. The sly, flamboyant Dragnet Girl showcases Ozu's fondness for American culture at its delirious peak. The director confidently sets up a tense, atmospheric mood for this jazzy, fast-moving tale of a gangster's moll desperately trying to get her boyfriend to stop mentoring an impressionable boxer and live a respectful life. Opening with a workaday office environment that calls back to King Vidor's The Crowd, we meet Tohiko (Kinuyo Tanaka), a seemingly ordinary secretary who spends her nights on the arm of the slicked-up yakuza boss Joji (Joji Oka). A former boxing champ, Joji becomes drawn to a green featherweight boxer named Hiroshi (Hideo Mitsui), who summarily becomes seduced by the glamorous, danger-filled world Joji represents. A wayward miscreant constantly sponging off others for money, Hiroshi is vigilantly watched over by his innocent sister, Kazuko (Sumiko Mizukubo). While Kazuko attempts to get Joji to leave her brother alone, the gangster ends up falling for the girl - meanwhile, Tohiko uses the episode as an excuse to get her beau to marry and ultimately give up crime for a respectable life. Joji insists on doing a final heist to help out Hiroshi, however, leaving the couple in a tight spot as fugitives from the cops who are closing in on them. 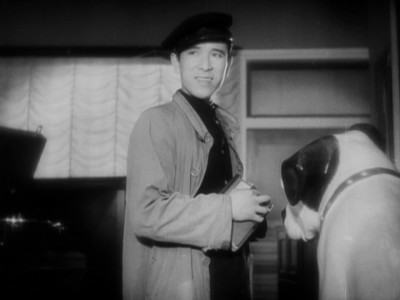 The showy, expressionist parts of Dragnet Girl are an interesting change for Ozu, although the focus on the characters' moral conscience is the thread that connects this film with his later work. It almost seems like a hybrid between the other two crime dramas included here and the quieter, more emotionally searing material which he'd eventually delve into. Although the film drags a bit once Tanaka and Oka (who are both superb) become lovers on the lam, this was a great example of how Ozu could take seemingly disparate elements (American-style culture and storytelling and atmospheric European filming techniques) and meld them into a satisfying whole. 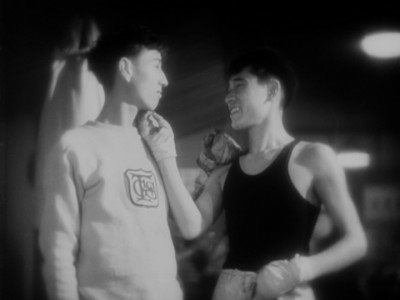 Ozu's nods to the West include the boxing posters which cover the walls at Joji's place, along with a French poster for All Quiet on the Western Front oddly placed in Hiroshi's bedroom. There's also a fascinating scene set at the record store where Kazuko works, with statues of the RCA's dog mascot, Nipper, given prominent display. Silent Ozu - Three Crime Dramas is packaged similarly to other Eclipse sets, with a paperboard slipcover holding together three clear plastic slim cases, one to a film. Essays on each film are printed on the inside front cover of each package. As with Criterion's Kinoshita and World War II Eclipse set, these films are presented in rough, unrestored prints which often show scratches, jitter and other signs of age. 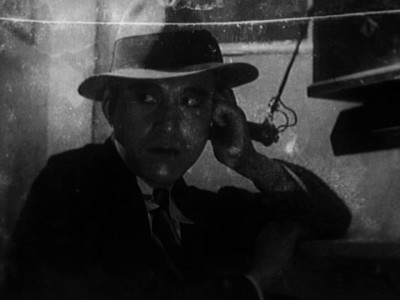 The first two films also sport a fair amount of nitrate damage, rendering a few scenes in clouds of stain-like texture. The mastering is professionally done, however, with a pleasing light/dark balance and a good amount of detail. Dragnet Girl's soft-focus compositions end up faring the best. The films come with new, pristinely recorded scores by Neil Brand. These simple, piano-based tracks don't particularly sound evocative of early-'30s Japan, but they accent the onscreen action in a pleasant way which never comes across as jarring. Optional English subtitles are the default viewing option on all three discs. None on the discs themselves, although each film comes with excellent essays from critic Michael Koresky, offering a wealth of background information. Charming, funny, visually striking, unexpectedly subtle and moving - would you expect any of that from silent gangster flicks made in Japan? If it's Yasujiro Ozu, the answer is hai (yes). Like Criterion's other Eclipse sets, Silent Ozu - Three Crime Dramas satisfies as a brief primer on a lesser-seen segment of a master director's vast filmography. Recommended.